On 22 April, join us on the climate bloc at the March for Science - London, part of a global movement of scientists pushing back against the rejection of evidence in favour of 'alternative facts'. Join on Facebook and find out more. In the US, the first 100 days of Trump's presidency - disastrous for the climate, the people of the US and those of the world - will be marked by a massive climate march in Washington DC. In London, we'll be showing our solidarity in London in a creative climate change action on Westminster Bridge at 1pm. 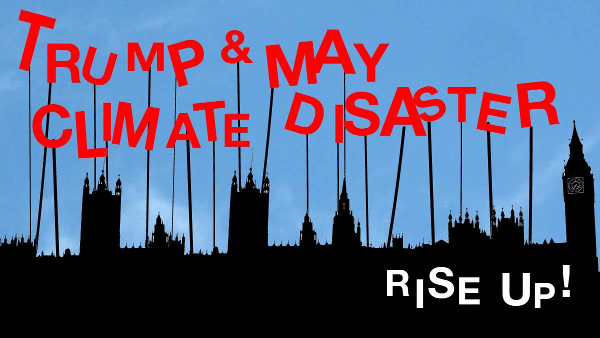 Before that, at 12pm, we'll be hearing from speakers who'll highlight practical actions we can take to stop the UK from following Trump down a path of climate disaster!